This disc has been issued before at bargain price. That was on Regis RRC 1218, reviewed here. It seems that it can also be had on Membran 222836. We are certainly none the poorer for its reappearance now. The sound is splendid and the performances are big and red-blooded without sacrificing sensitivity in the more tender passages. Mark Ermler has strong ex-Soviet credentials and I have had good cause to celebrate his Tchaikovsky ballets and his Borodin symphonies. Mention of Tchaikovsky is not out of place in the case of these Peer Gynt movements. They often take on a Tchaikovskian melancholy and fury. No one can complain that they are colourless or bland. There’s a sob in Solveig’s Song and it’s not out of place. The Royal Philharmonic show the same mettle they did in their under-valued Tchaikovsky cycle for Yuri Temirkanov and BMG. On this occasion, and with Ermler, they make a creditably Russian sound … yes, in Norwegian music. You can argue over comparative recordings of this popular lion of a piano concerto but when it comes to generous emotional engagement you will look in vain in this price bracket. 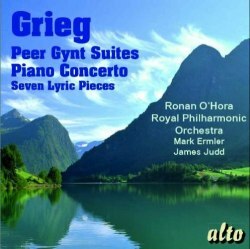 Ronan O’Hora is an extremely classy act and this version of the concerto need not look bashful in the company of the conventionally recognised reference versions: Lupu, Bishop and Curzon, to name a few. Judd is at the helm of the RPO for the concerto and keeps the orchestra splendidly alert. To bring the timing to within ‘spitting distance’ of 80 minutes Alto, and before them Regis, added seven of the gentle Lyric Pieces for solo piano. They have been cherry-picked - which is just fine - from five of the published sets. Perhaps the awkward To Spring sounds a mite rigid but the rest are done with placidly smiling serenity. The Notturno could be used to warm a room - put the hi-fi on a timer to play this for half an hour on repeat before you come home at the end of a long day. We do not know the recording venue for the Lyric Pieces or the Piano Concerto but the solo piano playing is captured in a warm but not fuzzy acoustic. It’s a case of clarity without a Nordic chill. As for the rampant Piano Concerto it roars and purrs magnificently. The typically extensive programme notes are by James Murray. A counsel of perfection would have called for the Holberg Suite instead of the Lyric Pieces but given that Alto could have stopped at just the suites and the concerto there should be no complaints of any consequence. We tend to forget that people are discovering famous classical music all the time. If anyone were to discover Grieg through this disc they would do well to top the experience from the pick of the full price catalogue.